PNNL has high pressure hydrogen autoclaves capable of soaking materials up to 5000 psi, and at elevated temperatures. These are large 1 gallon capacity systems capable of accommodating different in situ test systems. Electrical feed-throughs provide power and sensing for the instruments. Short descriptions of available equipment are listed here. Tribology: A custom built linear reciprocating (ASTM G133) pin on flat system that is capable of testing samples up to approximately 1” wide at XN, and 5Hz with a stroke length of ½”. The system was designed primarily for polymeric materials, but could potentially accommodate metals testing. This test methodology describes in situ testing of friction and wear (tribology) of polymers under high pressure hydrogen. This methodology is based in part on the existing tribological standard ASTM G133 “standard test method for linearly reciprocating ball-on-flat sliding wear”. 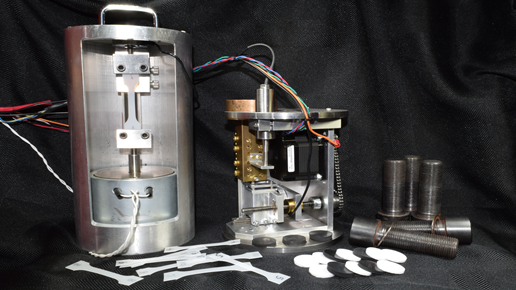 Friction and wear testing under a high-pressure hydrogen environment is critical for hydrogen fueling infrastructure components such as compressors, valves and other actuated devices. Here we present test a methodology for in situ friction andwear studies of polymers under 28 MPa (4,000 psi) hydrogen in a linear reciprocating custom built apparatus. Supporting data from in situ acrylonitrile-butadiene rubber (NBR, commercially Buna-N) tests in 28 MPa (4,000 psi) hydrogen are presented.